Sure, sure, patch 8.2 has two massive new zones, two megadungeons, more of the war campaign (what’s going to happen to my buddy Baine?! ), and a raid where we finally get to confront Azshara. That’s a lot of content. It sounds like fun. I’ll probably enjoy it. 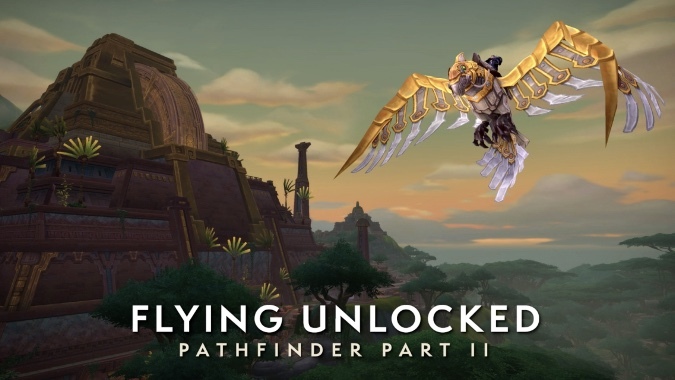 First, let’s get what we know out of the way: the Pathfinder: Part 2 achievement will arrive with the patch, unlocking flying in Battle for Azeroth. Finally, we’ll be able to take to the skies and skip over vast swaths of annoying mobs while we do world quests (or while we level alts). We knew that was coming. What we didn’t know was that in addition to flying in Kul Tiras and Zandalar, we’ll be able to fly in Nazjatar and Mechagon. In the Broken Isles and Pandaria, flying never extended to zones that were added post-launch, so you remained tethered to the brutal ground while exploring Argus and the Timeless Isles. In 8.2 we’ll be able to fly everywhere… at least as soon as we complete Pathfinder Part 2. While we don’t know the specific requirements yet, if it’s like the last two Pathfinder achievements, we’ll have to explore the new zones on foot and reach revered with the associated factions. So we’ll still be tethered to the ground for a while, but soon we will be truly free from the tyranny of gravity. When we unlock flying, we’ll also get a shiny — very shiny — mechanical parrot mount. 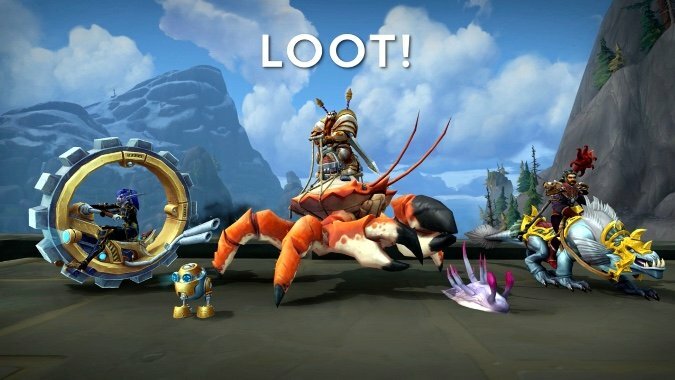 And that’s not all: we also saw a crazy mechanical wheel mount and a crab mount, which probably come from Mechagon and Nazjatar, respectively. I am especially excited to see just how that wheel is animated… but let’s be serious, I’m probably still going to ride Hogrus for the rest of the expansion. And I’ve saved the very best for last, because 8.2 comes with a new equipment slot for mounts. 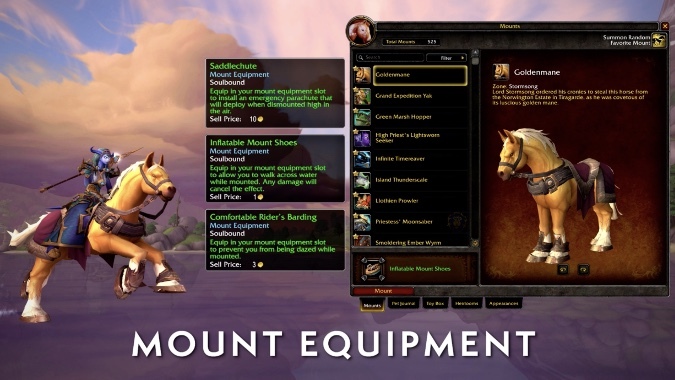 The system is pretty simple: there’s a single equipment slot in your mount collection window, and whatever you equip applies to all of your mounts. You need to be level 100 to equip this gear, but once you’ve equipped it, it’s account-wide and all of your characters who can ride can take advantage of it. We’ve seen three pieces of gear so far: a “saddlechute” that deploys a parachute to save you from falls, a pair of inflatable shoes that give any mount waterwalking, and barding that prevents you from being dazed. I’m going to be really torn between the saddlechute and the waterwalking, personally. There’s no word on whether you can swap them out, but I would guess they’ll act like gems, in which case you could replace your current gear with something new, but destroy the existing piece in the process. Patch 8.2 will be going live on the PTR next week, so we’ll be able to see all of this (and more) in action then. There’s still no announcement on when it will go live and you’ll finally be able to get your own saddlechute, but my guess is that we have another month to wait at the very least. Until then, I’ll just be over here doodling pictures of my mounts sprouting parachutes on their way down steep hills.